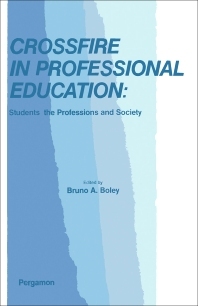 Crossfire in Professional Education: Students, the Professions and Society consists of papers collected at a conference of the above subject held in Evanston, Illinois on October 16-17, 1975. This collection of papers explores the pressures and conflicts to which professional education is subject. The focus is on problems facing professional schools that play significant roles in society. One paper discusses society, technology, and professional expertise and then tries to answer the question of balancing the opposing tensions between technology and human values present in the professions. This paper outlines the university structure and the crisis of professional education, including the responsibilities of the university composed of students, professions, and some elements of society. Another paper discusses the contradictions facing universities as places for both scholarly learning and education for action. One paper tackles the purpose of graduate education, while another paper discusses the negative perception of lawyers in society, stemming from the fact that some professional qualities are not developed in law schools. This text concludes that professional education should respond to the needs of quality, instead of just to any kind of growth. This book is suitable for academicians, educators, university and college administrators, as well as to members of the higher educational professions.